These VMGP cast iron exhaust manifolds are the only manifolds which are genuinely correct in all respects. We are the sole manufacturer / distributor of this part and it should not be confused with the Turkish extraction product offered on the internet elsewhere. The original MG manifold was cast by Qualcast, part of the Crane Foundry and now owned by Bosch. 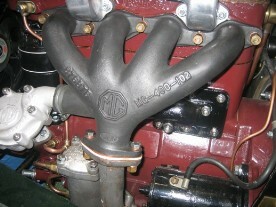 Vintage MG Parts have been granted consent to recreate this manifold correctly to incorporate the original 1930s corporate oval 'Qualcast' logo. This permission is conditional on highlighting that this is not a Qualcast product, all liability is retained by Vintage MG Parts and as such, our initials 'VMGP' are discreetly incorporated on the back face of each manifold. Note on the photo below, the letter 'C' in 'Qualcast' tilts backwards. This is just how particular we are when we remake original MG factory parts. We use the correct profile MG logo which appeared on the manifold in the 1930s with correct font lettering and also, round cross section tubing ie not flat sided. They are cast in fine sand for a quality finish with high deffinition. If it does not have the 'Qualcast' logo, then it is not the VMGP manifiold you are looking for! VMGP manifolds are either in stock or machined to order and are supplied sprayed in a heat proof, satin black finish.